HERMANN Spielwaren, also often referred to by experts only HERMANN-Coburg, is one of the oldest still existing teddy bear companies in the world. No serious teddy-technical book is not in the details the teddy bears in Coburg. 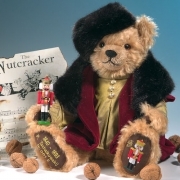 Teddy bears from earlier decades manufacturing are rare today and coveted collectibles (Teddybären ab 1904 von Christel und Rolf Pistorius, ISBN 978-3-874463-464-3). The tradition goes back to 1913 when Hermann Max, along with his brothers Arthur and Adelheit, made the first bear..
We stand by our staff. Many are 10, 15 or even 30 years in the company and have been specially trained by us to manufacture the HERMANN Coburg Teddy Bears. In addition to our "Trainée on the job", each of our employees has a vocational qualification in at least one, for the manufacture of teddy bears, relevant area. We guarantee GENUINE MADE IN GERMANY. All bears are manufactured in Coburg Cortendorf. In the "Week of Open House" always on Ascension, you have the opportunity to convince yourself by visiting the manufacturing and personally talk to the people who make the teddy bears for you. This allows us to monitor each production step directly affect and so provide the superior quality. Unless otherwise specified, each item in the amount indicated in Coburg Cortendorf is physically in stock. A shipment can therefore immediately, at the latest, following the order date, place business day. Please note that "payment in advance" of the receipt of payment necessary to wait for the payment. We would also be deliver to you at a certain date, for example if you want to surprise someone. We also provide a delivery address specified by you desire. - We think of it! - If the bear is supposed to be a gift (please tell), we do not put the bill at the delivery, but send it as a separate letter with this post - without charge - to the invoice address. You have the choice: PayPal, credit card or prepayment. Select the type of payment is convenient for you personally.